Students play the flag matching game. The Department of International Languages and Cultures (ILC) hosted the 16th annual Rosita Award Ceremony on April 29, welcoming about 75 attendees for the catered dinner, student performances, games and awards. The Rosita Award recognizes students who embrace the spirit of multilingualism by continuing the study of language beyond the beginning level. In order to be eligible, students must be currently enrolled at Webster University and must have received a B or better in at least four language or culture classes. The Rosita Award is possible because of generous donations from faculty and staff. The original fund was put in place by Consuelo Gallagher, who wanted to reward students for pursuing language study. Gallagher was a professor at Webster and has made many other contributions to the success of the University and its students. The ILC welcomed the participation of the Center for International Education, Centre Francophone and English as a Second Language. The Rosita Award recognizes students who embrace the spirit of multilingualism by continuing the study of language beyond the beginning level. Each Rosita candidate receives a certificate and is entered into a drawing for a $250 scholarship. Twenty-seven students qualified for the drawing this year. At the ceremony, the Gorlok made a surprise appearance and conducted the drawing, selecting two winners, Emily Sharpe and Yan Su. Sharpe plans to use her $250 award to help fund her summer study abroad trip to Geneva. Each of the seven International Distinction awardees were given a certificate: Anas Alzahrani, Manuel Leon Hoyos, Fredericka Louis Schmitendorf Brandt, Aaliyah Sekatawa, Laura Steele, Giang Tran, and Truong Minh Tuan. 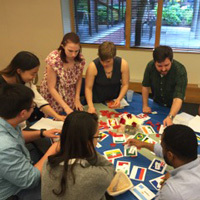 To be eligible for the International Distinction Award, students must have reached academic competence in a second language, studied abroad for at least one term, and have acquired international field experience. The International Distinction Award is also acknowledged on students’ diplomas. New this year were the awards for the International Studies Global Citizen High School Essay Contest. An announcement about the contest was sent to over 70 area high schools asking juniors and seniors, “What is a global citizen and why is it important to be one?” Submitted essays were ranked by members of the International Studies Committee and the ILC. 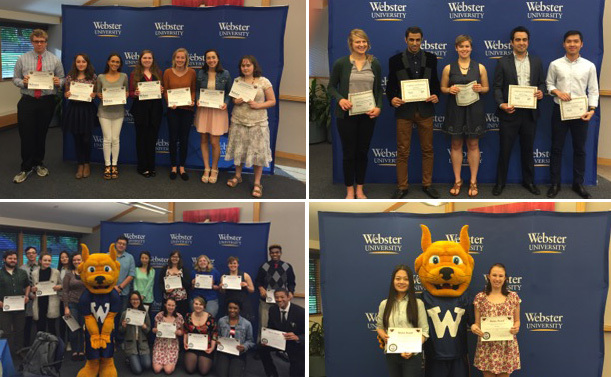 The top 10 finalists were invited to Webster University for an afternoon of enrichment. The students went on a campus tour, participated in a language table, attended a panel discussion, and engaged in a culture exchange. After their afternoon of activities, the 10 high school students and their parents attended the Rosita Ceremony in which they received a certificate, a bag of Webster swag, and a book about studying abroad. The essay contests was launched in a hope to create a positive image of Webster University and International Studies in the community.